Giant removals are the moving specialists based in London. With over 8 years of experience in the removal industry in London, we exactly understand the needs and requirements of clients, and precisely that's the reason why we have the unparalleled capability to provide just the perfect moving solutions to our clients located anywhere in London. Be it a small moving job or it may be a big scale removal job, such as home or office moving, our exceptional man and van services will perfectly suit your needs and requirements as well as your pocket. 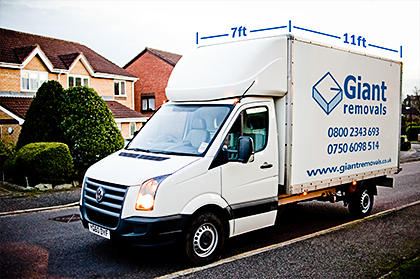 At Giant removals, we take great pride in the fact that currently we can provide you the best value for money moving services at unbelievably low prices. We are here to take all the troubles and headaches out from your moving experience. Contact us right now. If you are striving to find the best Man and Van London services, don't think twice before calling us. Our world-class removal services are available at a very short notice, and can provide you fully customized moving solutions right from moving small items to full scale home or office moving. Given below are just a few of the prominent benefits of availing our outstanding moving services. 24/7 moving services for both commercial and domestic moving needs anywhere in London. Punctual, reliable and trustworthy; All our moving professional are fully trained and experienced to handle your delicate, as well as extra heavy items with utmost care and professionalism. We properly screen all our employs for background checks and police records, so as to make sure that your valuable are in safe and efficient hands. All our moving services are available at really competitive prices. We always inform our clients about the entire expenses upfront, and we don't charge any additional expenses later on. Fully equipped vehicles with GPS and trackers so that we can accomplish your moving job in the fastest possible time and in the most efficient manner. Get in touch with us at enquiry@giantremovals.co.uk for a free quote or simply fill our online form. Giant removals has an unparalleled reputation in London moving industry, and our outstanding team comprises of exceptionally skilled and experienced professionals who are ready to provide you flawless and superbly efficient man and van services for all your moving needs in London, no matter how small or large. What's more, with our vast experience in London removal industry, we can even advise you on the best ways to carry out any type of moving job quickly, efficiently and with minimal expenses. Our established presence and the large number of moving experts provide us the capability to provide you our excellent removal services at a short notice anytime you want. Therefore, if you are looking for removal services that can help you move immediately, 'Giant removals' is undeniably the best option for you. To know more about our services, and how we can help you, contact us right away. Our friendly customer support representative will help you out in the best possible way, will clear all your queries and provide you with the most accurate quote.